Figure 5. EGF-R kinase activity was measured in a radioisotopic filtration assay using the following reaction conditions: 60 mM HEPES-NaOH, pH 7.5, 3 mM MgCl2, 3 mM MnCl2, 3 uM Na-orthovanadate, 1.2 mM DTT, ATP (variable), 2.5 ug / 50 ul PEG20.000, Substrate:PolyEY, 10 ug/50 ul, Recombinant EGF-R: 5 Units/50 ul. Figure 1. 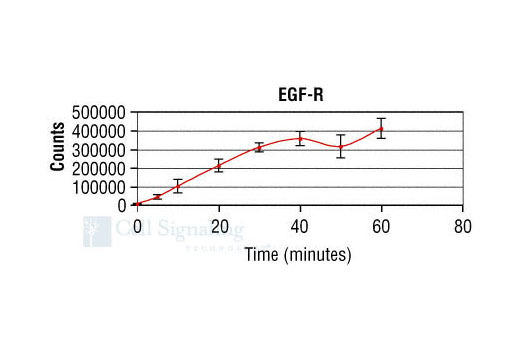 Time course of EGF-R kinase activity: DELFIA® data generated using Phospho-Tyrosine Monoclonal Antibody P-Tyr-100 #9411 to detect phosphorylation of EGF-R substrate peptide by GST-EGF-R kinase. In a 50 ul reaction, 10 Units GST-EGF-R and 5 uM substrate peptide were used per reaction well. Background reading is 5144. (DELFIA® is a registered trademark of PerkinElmer, Inc.). Figure 2. Treatment of Tyrosine Kinase Substrate Screening Kit #7450 with EGF-R Kinase. Positive control is in yellow and negative control is in blue. 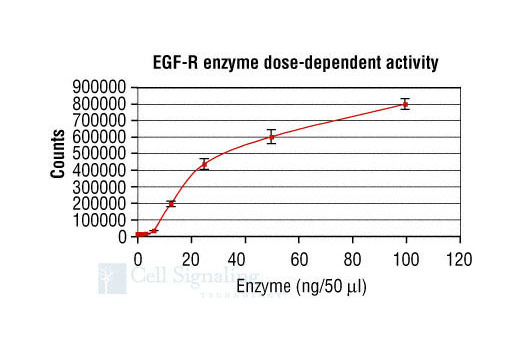 Several positive hits for EGF-R were identified using this approach (in red). 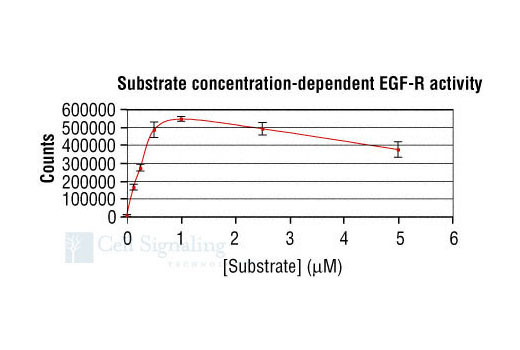 The star indicates the peptide chosen for this HTScan® EGF-R Kinase Assay Kit. Quality Control: PTP1B peptide was selected by using Tyrosine Kinase Substrates Screening Kit #7450 to screen for EGF-R kinase substrates. 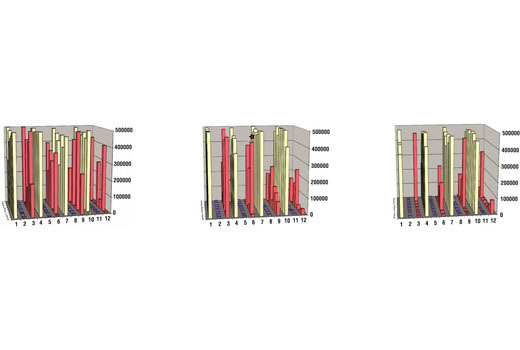 Phospho-Tyrosine Monoclonal Antibody #9411 was used for detection (fig.2). The quality of the biotinylated peptides was evaluated by reverse-phase HPLC and by mass spectrometry. Purified EGF-R kinase was quality controlled for purity using silver stain SDS-PAGE and Western blot. 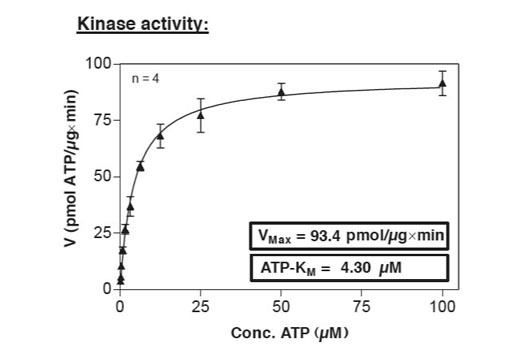 EGF-R kinase Vmax and Km values were measured to determine specific enzymatic activity (fig.5). 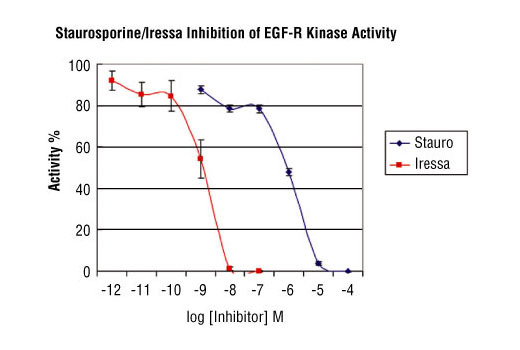 Assay conditions (time course [fig.1], kinase dose-dependence [fig.3], substrate dose-dependence [fig.4] and inhibitor sensitivity [fig.6]) for EGFR kinase activity were verified using the EGF-R substrate peptide provided in this kit. Description: The kit provides a means of performing enzymatic assays with active human EGF-R kinase. It includes active EGF-R kinase (supplied as a GST fusion protein), a biotinylated substrate peptide and a phospho-tyrosine monoclonal antibody for detection of the phosphorylated form of the substrate peptide. Unit Definition: 10 Units is defined as the amount of EGF-R kinase required to maximally phosphorylate 75 pmol of PTP1B (Tyr66) #C03-1727 biotinylated substrate peptide in 30 minutes at 25ºC in a total reaction volume of 50 µl quantified by DELFIA®. Storage: Antibodies are supplied in in 10 mM sodium HEPES (pH 7.5), 150 mM NaCl, 100 µg/ml BSA and 50% glycerol. Do not aliquot the antibodies. Peptides are supplied at 6 µM in 0.001% DMSO. Enzymes are supplied in 50 mM Tris-HCL (pH 8.0), 100 mM NaCl, 5 mM DTT, 15 mM reduced glutathion and 20% glycerol. Store at -80ºC. Keep enzymes on ice during use.